To celebrate our 30th Anniversary Gala, join us for The Music of Fela Kuti, the towering figure who pioneered and dominated the Afrobeat movement worldwide and inspired the spectacular hit musical, Fela!, now on Broadway. 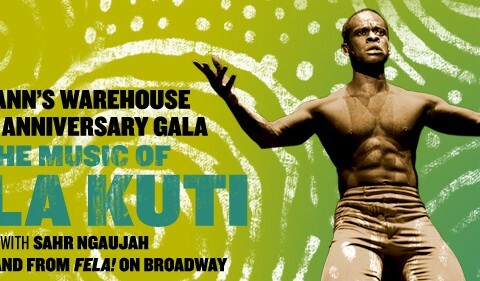 Sahr Ngaujah, the magnetic star, and the Fela! Band will rock St. Ann’s Warehouse with an intimate, one-time-only performance, arranged especially for St. Ann’s Warehouse. You’ll be up and dancing to Fela’s “irresistible” charge, feeling like “you have been dancing with the stars, and I mean astral bodies,” says Ben Brantley of The New York Times. Join us for cocktails, the show and dinner, and give lift-off to a fourth decade at St. Ann’s Warehouse!